Welcome to the Verandas Resort, a beautiful vacation destination in the Ocean Drive Section of North Myrtle Beach. Verandas offer amenities that every family will enjoy, such as oceanfront swimming pool, lazy river, garage parking, elevators and best of all, it is in close proximity to Main Street where you'll find fantastic dining, great shopping, sweets and treats galore and the Ocean Drive Pavilion & Amusement Park. 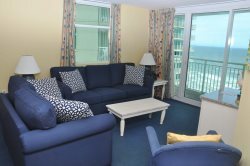 This oceanfront resort offers two and three bedroom condominiums with all the comforts of home. Fantastic ocean views, warm breezes, and that famous Carolina sun will make your next vacation at Verandas a truly memorable experience.